If you’re visiting the Great Smoky Mountains National Park for the first time, you’re in for a treat! There are many reasons why it’s the most visited national park — from its gorgeous sights, to its abundance of wildlife. To help you have the perfect trip, we’ve put together a list of the top 6 things to do when you visit the Smoky Mountains National Park for the first time. The Smoky Mountains are home to many gorgeous cascading waterfalls, and you’ll definitely want to take the time to explore some of the top waterfall hikes! One of the most popular waterfalls in the park is Laurel Falls, an 80-foot waterfall that has an upper and lower section divided by a walkway at the base of the upper section. To see the tallest waterfall in the park, hike the Ramsey Cascades Trail. Ramsey Cascades is a beautiful waterfall that drops 100 feet over rock outcroppings and collects in a pool at the bottom. The trail is 8 miles roundtrip and is definitely worth every step! Other popular waterfalls include Grotto Falls, Rainbow Falls and Abrams Falls. If you love to fish, then you will love visiting the national park. The park has 2,900 miles of streams, all of which you can fish in! It protects one of the last wild trout habitats in the eastern United States. There are a variety of angling experiences for you to enjoy, from remote, headwater trout streams to large, coolwater smallmouth bass streams. You can fish year-round, from sunrise to sunset. When you visit the Smoky Mountains, be sure to keep an eye out for wildlife! You have the chance to see a variety of wildlife, from white-tailed deer, to black bears, to turkeys. The best times to see wildlife are in the early mornings and late evenings. The national park has about 65 species of mammals, more than 200 varieties of birds, 67 native fish species and more than 80 types of reptiles and amphibians. One of the best spots to see wildlife is in Cades Cove. You’re bound to work up an appetite during all your exploring in the park, so why not pack a delicious picnic to enjoy in the fresh Smoky Mountain air? The park has a number of picnic sites for you to use that have picnic tables and a raised grill for cooking. Nothing will get you prepared for more fun in the park than a tasty lunch! While you’re having fun in the national park, spend some time taking in the breathtaking scenery around you. 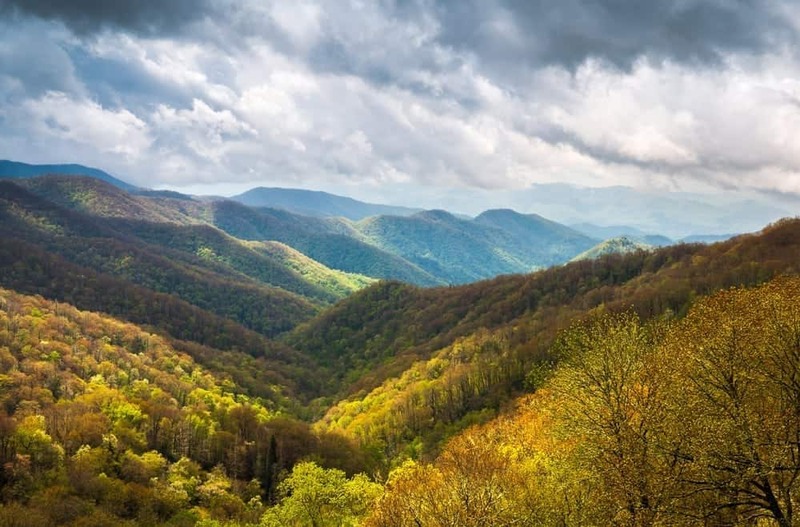 The Smoky Mountains offer gorgeous views during all the seasons, from snow-covered mountaintops in the winter to beautiful wildflowers in the spring. Make sure to bring a camera along to capture all the picture-perfect sights! Before you visit the Smoky Mountains National Park for the first time, read our blog, “Top 10 Things to Know About the Great Smoky Mountains National Park Before You Go,” then plan your trip!